What Is This Dog Feeling? 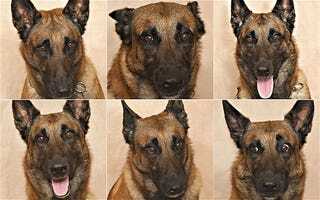 A study suggests that you can really tell the emotional state of a dog just by looking at a picture of it. volunteers could correctly spot when a dog was happy, sad, angry, surprised or scared, when shown only a picture of the animal’s face, suggesting that humans are naturally attuned to detecting how animals are feeling. It's not known if this ability extends to other animals besides dogs. The abstract of the study (including all 21 dog images used in the test) can be found here.